We are not gravy lovers. While I understand the attraction of this well loved umami laden sauce, I find it generally masks the flavour of the food it accompanies. Mustard, pickles, chutneys, relishes, salsas and sauces are our preferred condiments, lighter flavours that are complementary without hogging the limelight. Citrus fruits have an amazing quality, their zesty freshness making a perfect marriage with sweet rich meats such as pork, duck, turkey, meaty fish like tuna, chicken, even top quality sausages. 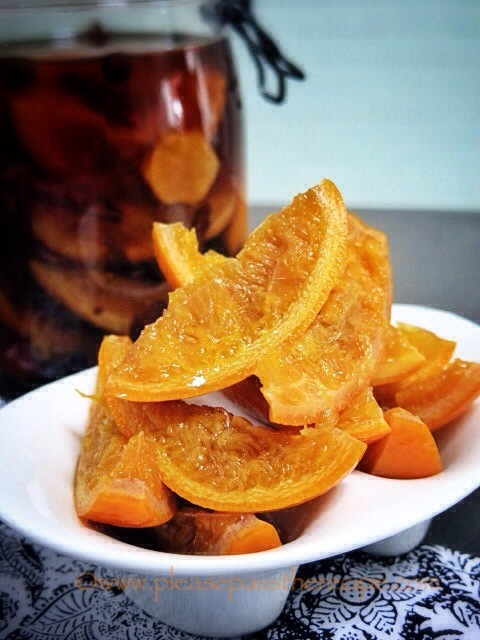 It’s navel orange season in Australia right now, the perfect time to make orange preserves, both sweet and savoury. These slightly sweet, slightly sour lightly spiced orange segments taste as good as they look. They are quick and simple to make, but you need patience, as they get better with time. They will be ready to eat after a week, but are much better after a month has elapsed. Make some now for summer. Wash a 1 litre preserving jar and lid. Put the jar in the oven at 120C while you prepare the oranges. Cut the fruit into quarters, put them into a saucepan, add water to cover, bring to the boil, then reduce the heat and simmer for 15 minutes. Drain. Combine the vinegar, sugar and spices in the saucepan, bring to the boil, stirring until the sugar has dissolved. Add the orange quarters to the vinegar syrup, return to the boil then cover and simmer for 15 minutes. 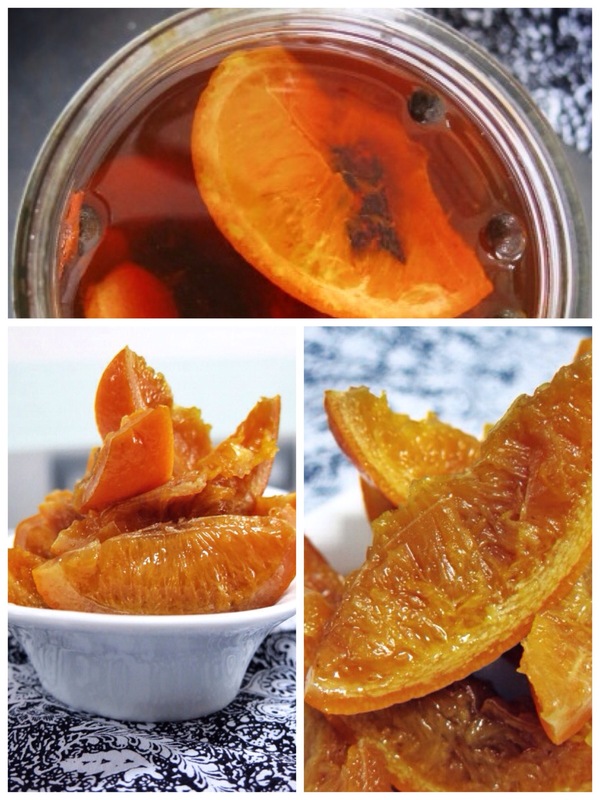 Using a slotted spoon, pack the oranges into a hot sterilized jar, the add the vinegar syrup. The oranges will be ready in one week, but wait a month if you can. Hi I have just made this and have got half the liquid left. I’ve had pickled peaches but never oranges…I can’t wait to try them. I’m not a fan of gravy either!! This sounds like a fabulous alternative. Thanks Gab, pickled oranges are good! A great looking spiced oranges. I love the fusion of the ingredients. To be honest, I never had them, but I sure would love to. Make a batch Fae, they are so simple, and delicious! What is the purpose of parcooking the oranges first? Removing bitterness? Love this Sandra! I love chutneys and relishes. And like you would much rather enjoy them with meat than gravy. Looks fairly simple to put together too. Very simple to make Seana, the hardest part is waiting! Hi Sandra, I have that book, I think it would make a great feature cookbook. Your oranges look great. I tend to make this sort of thing and then never eat it. I still have jars and jars of pickled quinces in the pantry, I have no idea what to to with. I pickle all sorts of things. They are great with any grilled or roasted meat, cold cuts like ham or leftover roast, with sharp cheese, as a component of a ploughman’s lunch, even whizzed into mayo for an interesting sauce. Pickles never last long here! That looks great- with anything. May get back to the source! It’s always worth revisiting old cookbooks Francesca. There are always old favourites to revisit and new gems to discover! Still love Margaret and these looks gorgeous, sunshine in a jar. What a gorgeous description Cheery! Wow. I can just imagine these with a pork roast. I do something very similar with quince which are equally good with pork. I agree regarding gravy (except with turkey at Christmas time – nostalgia here). I’ll have to bookmark this for the autumn/winter season when the Spanish oranges begin to flood our markets. I have never heard of Margaret Fulton – am I showing my ignorance of all things Australian again? Margaret Fulton was our first Australian pop cookbook writer. She introduced us all to basic French & Italian cuisine, and was everyone’s dinner party recipe favourite. She pioneered the change in the way the average Aussie family ate. She’s now considered a National Living Tresure! Most young Ausjsies have never heard of her either!! Eat the whole shebang Sas, it’s delicious, kinda like spicy sour marmalade. This entry was posted on August 12, 2014 by ladyredspecs in FODMAP diet, Food, Gluten Free, Pantry Essentials, Pickles & Chutneys, Preserves, Side Dishes & Salads and tagged FODMAP diet, oranges, pickle, spice.